Celebrate the best holiday ever! 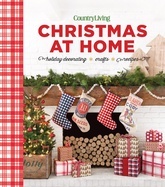 Country Living knows how to make Christmas memorable, and that’s why this spectacular book will become your new go-to resource for the holidays every year. It’s filled with more than 200 beautiful decorating ideas, delicious recipes, and crafts, plus tips galore. Stunning photos show festive table settings; splendidly decorated trees; fun and easy Christmas projects, from wreaths to no-sew stockings; gifts from the kitchen; and gourmet-worthy recipes like Turkey Roulade with Sausage-Cornbread Filling, Brown Butter Mashed Potatoes, Christmas Wreath Salad, Sloe Gin Ham, Slow-Cooker Apple Cider, and sweet treats like Red Velvet Snowballs and Chocolate & Cranberry Fudge. Have yourself a merry little Country Living Christmas!